On 12 February 2019 the Finnish Member of Parliament and candidate in the European elections, Ville Niinistö, tweeted that decline in insect populations form a large environmental risk. An additional tweet linked to an article published by the Finnish national broadcasting company YLE concerning the subject. 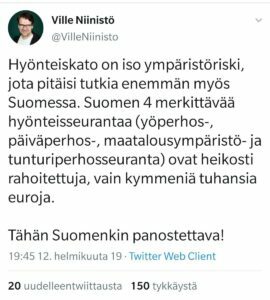 Niinistö also claimed that the presumed decline should be studied more also in Finland and that the four major insect tracking programs in Finland are poorly funded. Niinistö estimated the budget to tens of thousands of euros. Tweet by Finnish Member of Parliament Ville Niinistö. The YLE article which Niinistö posted on Twitter covers a study published in the January 2019 issue of Biological Conservation. YLE says that the results of the study show that on a global scale the overall biomass of insects is shrinking at an annual rate of 2,5%. However, the results may have also been interpreted too broadly according to critics. According to the Finnish nature magazine Suomen Luonto, the study has been interpreted falsely in the media and the main author Francisco Sánchez-Bayo went too far in his comments to the British newspaper The Guardian. The article in The Guardian was referred widely in the Finnish media. Suomen Luonto says that the main problem of the insect decline study is that it only focuses on the already declining populations while leaving the stable and growing populations out. The study is based on 73 historical reports of insect declines around the globe, focusing mainly on Europe and North America. It shows that many populations have declined massively, particularly in Europe and Puerto Rico. However, the study clearly points out that the extent of the losses cannot be accurately quantified worldwide due to a lack of historical knowledge in large areas of the world such as Australia, China, sub-tropical and tropical countries. While the Biological Conservation study can be criticized on many points it clearly shows that decline in insect populations can disrupt the proper functioning of multiple ecosystems. According to the study, insects provide pollination, natural pest control, food resources and decomposition services among other functions. The decline also has a major impact on entire ecosystems as insects are the base of many complex food webs. And even if some of the declining species could be replaced with the growing populations, the overall biomass of the declining species could be too big to be compensated. All the Finnish insect experts whom were interviewed for this fact check seemed to agree on the seriousness of the declining insect populations and the effects of the decline on entire ecosystems. There are inadequacies in the Finnish insect tracking projects according to the experts. The tracking of many populations is currently based on volunteer work and is under constant threat of diminishing resources due to the lack of funding at the government level. According to the researchers coordinating the major insect tracking programs, the funding of the programs is indeed at the level Niinistö estimated. We managed to contact three of the four program leaders who estimated their budgets from around 2600 euros per year to around 60 thousand euros per year. Reima Leinonen, Environmental Expert for the ELY Centre of Kainuu (A regional agency for economic development, transport and nature), said that decline in insect populations is indeed a large problem. The tracking network of populations is also difficult to manage due to the inefficient funding. The future is at least a bit brighter. Finnish Environment Institute reported in late February 2019 that the new EU project, ABLE (Assessing Butterflies in Europe), is in the works. The project is being funded by the EU for an initial period of two years. Its main purpose is to expand the tracking of butterflies in Eastern and Southeastern Europe and to assess the health of the environment. The objective is to start tracking in at least eight new EU countries. All the data gathered will be sent to a common database. From there, the data will be available for use by all researchers. There is scientific evidence on the severity of insect decline as an environmental risk. On the global scale there is not enough data to assess the extent and probability of insect decline. When it comes to the funding of insect tracking in Finland, the program leaders confirm the budget figures. In conclusion, the facts in the tweet are mostly true. The incorrect name of Juha Pöyry’s employee was corrected on Friday 29 March 2019.